‘The Hobbit‘ joined the $100 million in five days club and has made $293.2 million in the USA alone. 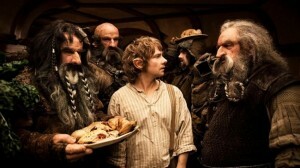 The next film in ‘The Hobbit‘ series will be released in December, with the third one coming out in July of next year. I’m curious to see if any of ‘The Hobbit’ films win Best Picture and cross the $1 billion dollar mark, like ‘Return of the King‘ did. But this is huge news. I bet the sequel will make even more. Your thoughts? This entry was posted on Tuesday, January 29th, 2013 at 12:13 am	and is filed under Film, News. You can follow any responses to this entry through the RSS 2.0 feed. You can skip to the end and leave a response. Pinging is currently not allowed. « Check Out These New Images from Rob Zombie’s ‘Lords of Salem’!! !